Cloud Software changes quickly, our award winning Cloud Trainer Subscription service is here to support your organisation. Our team of trainers are experts in Office 365, Office, Workflow Max, Google Apps and much more. Providing training when you need it and specifically on the areas you need, our service is designed to build your skill and allow you to get the most from your cloud software. Subscribers gain access to our knowledge base and guides along with preferential rates on flexible training delivery options including classroom, presentation based training and live online training via Skype for Business. Live seminars are free to attend. 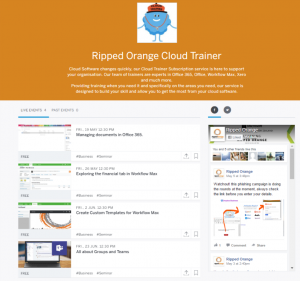 Each session will be recorded and made available with a printed guide to Ripped Orange clients that subscribe to our Cloud Trainer service.